For more than 20 years, much of the leading research on Alzheimer's disease has been guided by the "amyloid hypothesis." This theory focuses on one of the disease's most salient traits: the formation of unusual plaques—or buildups of protein—in patients' brains. In Alzheimer's, these plaques are made from a protein known as beta-amyloid. As a result, many scientists believe that removing beta-amyloid or inhibiting its clumping should help to stave off dementia. But with a series of failed clinical trials raising questions about this premise, some researchers are looking for deeper explanations into the causes of Alzheimer's and how this debilitating condition can be treated. University at Buffalo biologist Shermali Gunawardena is among these investigators. Breakdowns in this transport system can lead to "traffic jams," and some scientists hypothesize that such blockages precede the formation of plaques in neurological diseases like Alzheimer's, Gunawardena says. Using the neurons of fruit fly larvae, her team has been researching the role of presenilin—another Alzheimer's-linked protein—in axonal transport for several years, with the latest results published on May 22 in the journal Human Molecular Genetics. 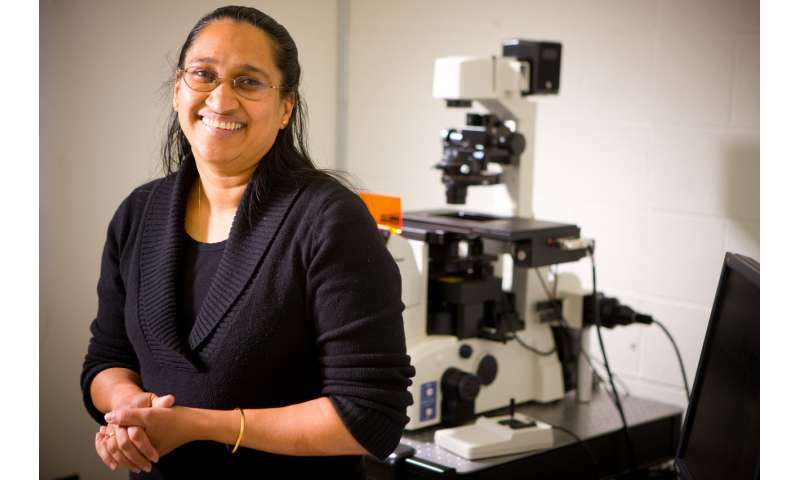 "We are looking at processes that occur before cell death, before you start to see plaques in the brain," says Gunawardena, Ph.D., an associate professor of biological sciences in the UB College of Arts and Sciences. "A lot of the treatments being developed for Alzheimer's are targeting beta-amyloid, but maybe we should be targeting processes that happen earlier on, before plaques are formed." Gunawardena and colleagues have been publishing on presenilin and axonal transport since 2013. Their first study on the topic showed that presenilin helps to regulate the flow of traffic in fruit fly neurons, influencing how quickly molecular motors (akin to trucks) travel along thread-like roadways called microtubule tracks. Since then, the team has shown that presenilin works in tandem with an enzyme called GSK-3β to control the motors' behavior, including the motors' movement and the way the motors bind with organic bubbles called vesicles that carry cargo such as proteins needed for cellular survival, signaling and repair. The researchers' latest study, the May 22 paper in Human Molecular Genetics, provides details on how presenilin interacts with GSK-3β, and reports that a specific molecular structure within presenilin—a loop region—is necessary for proper traffic control. Together, the studies conducted over the years are providing insights that could one day inform new avenues for treating or preventing Alzheimer's, Gunawardena says. Her research illustrates the complexities of neurological disease. Presenilin has an important role in Alzheimer's: The protein aids in the production of beta-amyloid, which, when overproduced, causes plaques to form in patients' brains. But Gunawardena's work shows that presenilin may also have another role—this one positive—in regulating the flow of traffic within brain cells and preventing blockages that over time can lead to death of the cell and disease. This may help explain why genetic mutations that result in a loss of presenilin's function are linked to Alzheimer's, she says. "We are curious about the normal function of presenilin," she says. "What does this protein normally do? In the past, we have thought of it as being implicated in the production of beta-amyloid, but in fact, presenilin appears to also have a very different function independent of this. As we learn more about presenilin, it's possible that our research will result in new, more targeted opportunities for treating or preventing Alzheimer's disease."